Six bedrooms arranged over three floors; four with double beds, one with twin single beds and one with single bed with additional single underneath. Each bedroom has wardrobe and storage facilities, bedside reading lamps and a chair. There is a travel cot also. All bedding is supplied. Three bathrooms/showerrooms, towels supplied for both bathrooms and pool use. Living room with satellite TV, dvd player and comfortable modern furniture. Kitchen with cooker, dishwasher, fridgefreezer, microwave oven, toaster, kettle and generous supply of crockery and cooking utensils. Separate dining room with original bread oven. Veranda running full length of property offering good views of surrounding countryside and containing washing machine and drying area, shaded table and chairs plus bench and individual seating. Large courtyard with mature plants and fruit trees creating both shaded and sunbathing areas, dining table for up to 12, modern rattan-style garden furniture, table tennis table, basketball net, additional coldwater sink and fridge. Pool garden accessed via lockable gates for added security. This area contains large 10x5m pool, extensive collection of sun loungers, plus additional table and chairs for outdoor dining underneath the shade of the grape vines. BarBQ area by the swimming pool. We've been told that the property is ideal for a family/friends/intergenerational holiday with plenty of room for people to be together but also to have their own space. The swimming pool (with underwater lights for the evenings) and BBQ create a great place for people to come together. 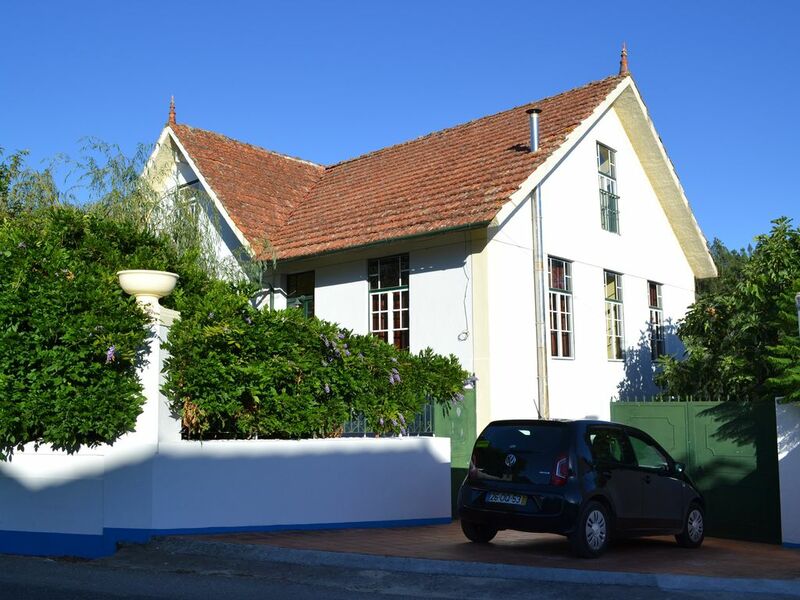 Beautiful traditional farmhouse in Portugal renovated to provide a six double bedroom holiday home with large pool and extensive outdoor space benefiting from off street parking and excellent facilities. The detached property is in the heart of the stunning Beiria countryside in a village with an excellent river beach (250m) and three cafes. Casal de Ermio offers easy access to a wide range of leisure pursuits including kayaking, fishing, hill walking, horseriding, go karting and a range of other tourist activities. Casal de Ermio is a ten minute drive from the town of Lousa which is based at the foothills of the Serra Lousa providing excellent walking and a host of interesting Schist villages. Lousa has a wide variety of shops and supermarkets,restaurants, cafes, takeaways, a market, two museums, a castle with an excellent restaurant and river beach. Less than half an hour away is the beautiful city of Coimbra on the magnificent river Mondego. Coimbra offers boat trips, historical sites and fado entertainment in several restaurants and cafes. The silver coast is less than a hour’s drive away with a wide range of tourist attractions, beaches along the coast and there are Roman ruins in cities nearby. Both Porto and Lisbon are less than two hours from the property. It's possible to log into https://cm-lousa.pt/ and access the local tourism information in Portuguese and English. There are radiators in every room. Bed linen supplied for all beds. The house has Wi-fi connection. Towels for the pool and the bathrooms are available. The dishwasher is situated on the veranda. The owner takes no responsibility for any accidents or mishaps that may occur during the use of the bicycles. Tenants are advised to check bicycles for suitability prior to using them. We love the outdoor space, the pool and BBQ area are very well maintained and are very private. We spent most of our time around the local area, our favourite spots were the river and Bar da Bogueira (5 minute walk away) where you can get food and drink, its a great spot for kids and is safe to jump in and swim. The local café in the village is very welcoming for coffee or an evening drink, it was good to see a few familiar faces who recognised us from our previous stay and made us all very welcome. The owners and caretakers are very approachable and friendly and did everything to ensure our stay was enjoyable. Thanks Michelle for your appreciation and kind words. We love the house ourselves and it's great to know that other families enjoy the house, the local environment, and the village as much as we do. We look forward to welcoming you and your family back to the house in the not too distant future. Thank you Patrick and Katrina for letting us stay in your home in June 2017. It truly was a magical experience for us - friends reunited from the UK and US. Thanks for all the information you sent before and during our trip. The house is a gorgeous renovated 3-story farmhouse, with some beautiful old features alongside modern updates. There was plenty of space for 8 adults and 2 kids (1 and 3), and the private groundfloor quarters were perfect for a peaceful sleep for the grown-ups less used to kids! ;) The secure gates at each level and at the pool were also peace of mind for the parents. The huge family bathroom was one of my favorite rooms! We ate apricots from the tree, and marveled at the fig, pomegranate, apple, grapes, and other fruit trees on the property. There are so many seating areas to catch up, read, eat together, or relax. We spent most of our time around the pool, which is a great size. Swimming with the view of the forested hillside was wonderful! We cooked in most nights or had a BBQ on the poolside grill, buying supplies from nearby lidl. The kitchen is relatively small, but has everything you need and it suited us fine. The river beach with bar (€1 beers! ), veggie food, and wifi was amazing and just a 5-10 minute walk away, depending on the size of your legs! Swimming a kilometer up the river and back one day was a highlight of the holiday for me. We also explored Coimbra city (25 minutes away), spent a day at the beach and Aveiro (the Venice of Portugal), went to many astoundingly beautiful wild swimming spots, waterfalls, and a gorge. We really appreciated the use of the bikes, and biked through to a circus fest and Ska night at the campsite in Serpins one night. All in all, I would stay here again in a heartbeat. Next time, I think we'll get the housekeeper too! Thanks Suzanne. Really pleased that you enjoyed your stay here. It must have been great to get the family together and mix common spaces with areas where you can chill out. A return visit for us. A fantastic area for mountain biking and a friendly village to stay in. Spend time exploring the local area or stay close to the farmhouse, where you can watch the river go by at the cafe and even take a swim. The house is big enough for friends or two families with great courtyard and BBQ area for outside dining. Highly recommended by us for anyone who loves the outdoors and getting away from it all. Thank you very much for your kind words, it's great to know that others appreciate the potential of the area, though we don't want it to get too well known!. Glad that you enjoyed it again. Hopefully see you again in the future. Stayed in the house as a family of 11 for a week. The house was gorgeous, beautifully kept and well kitted out with everything that we needed and more than enough room. It was very hot while we were there & the pool was a great bonus. It was cleaned every other day and really made our stay. The house is in a lovely town with a lively river beach & cafe & is close to great towns, shops & of course to Coimbra. Spent a day kayaking down the mondego. The kids all got to ride bikes and go exploring in the hills. Overall a great place for a holiday and a truely lovely house to be able to stay in. Thank you to Patrick the owner, we had a great holiday with lots of happy memories. My family and I stayed in the house for a week and it was absolutely fantastic. It had everything we needed plus more. The pool was amazing, we were all in it at every opportunity. My brothers loved the table tennis table. We also made use of the BBQ for an evening with friends and the courtyard areas offered ample seating and space for us to entertain our guests. The location was quiet which we preferred and it was handy for everywhere we wanted to visit. The owners are really helpful with any queries. We would definitely return to use this house again if we were visiting the area again. Follow directions from Coimbra for Lousa then at Foz de Arouce take the road for Casal de Ermio. The nearby countryside is lovely with a river beach 250 metres from the house. Lousa is a superb small town with all the facilities you would want - good restaurants, bars, a wonderful market, evocative buildings. Casal de Ermio is situation roughly half way between Lisbon and Porto and is well served by a number of airlines ( TAP, Easyjet, Ryannair and BA). Flexible changeover dates are available.